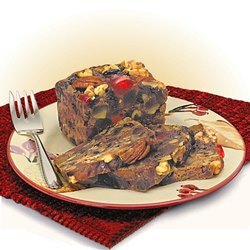 For families, gatherings or just one hungry fruitcake lover! Old-fashioned, dark, rich and moist; made from the finest ingredients – dried and candied fruits, nuts, and local farm-fresh eggs; soaked in 120-proof brandy and aged to delicious perfection. Ingredients: Pineapple (corn syrup, high fructose corn syrup, water, artificial flavor. 1/10 of 1% sodium benzoate, sorbic acid, sulfur dioxide), Raisins, Cherries (corn syrup, water, sugar, citric acid, preserved with less than 0.1% sodium benzoate and potassium sorbate, red 40, sulfur dioxide [preservative]), Walnuts, Honey, Wheat Flour (enriched with vitamin C, ascorbic acid, niacin, reduced iron, thiamine mononitrate, riboflavin and folic acid), Eggs, Pecans, Water, Margarine (liquid vegetable oil [soybean, canola], partially hydrogenated soybean oil, water, salt, whey [milk], lecithin [soy],mono diglycerides, sodium benzoate [as a preservative], artificial butter flavor, beta carotene, vitamin A palmitate added), Natural & Artificial Flavor, Spices, Salt, Brandy, Benzoate of Soda (added as a preservative). Contains: wheat, eggs, milk, soy, walnuts, pecans. May contain nutshell fragments. Nuts were packed in a facility that processes products that contain peanuts, walnuts, pecans. Our Lady of Guadalupe Abbey is a monastery of Cistercian (Trappist) monks who are devoted to a life of contemplation in a cloistered atmosphere. 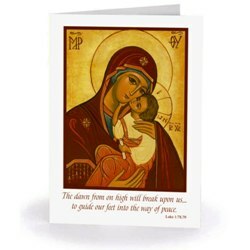 The Abbey began in April 1948 at Pecos, New Mexico, as a foundation established by Our Lady of the Valley Community in Rhode Island (precursor to St. Joseph's Abbey in Spencer, Massachusetts). 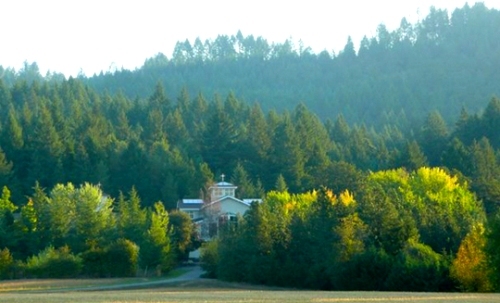 In March 1955 the monks, not finding farming sufficiently yielding at that high altitude, sold the property to the Benedictine monks and moved to Oregon. In recent years the Community has numbered between 35 and 40 members, who range in age from their twenties to their nineties. Trappists are committed to self-sufficiency, and strive to live solely by the work of their own hands. To this end, Our Lady of Guadalupe is home to several small industries: they harvest 900 acres of Douglas fir, operate a small bookbinding shop and a large wine warehouse serving neighboring wineries, and, since 1982, they have baked their popular Trappist Abbey Fruitcakes. The Best I have ever tasted. Shared with a neighbor, he agreed also. That is a home run fruit cake. Better than my late grandma's. 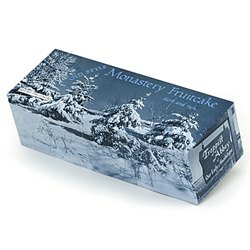 The Brandy fruitcake is delicious; moist and full of nuts, citron, and everything you expect from the Abbey Monastery. I plan on ordering another before the holidays! This fruitcake is extraordinary. Moist, dense with fruit, addictive. My husband and I have already finished 3 lbs and will continue enjoying more. This is the finest fruitcake, the best of the best, and almost too good to share. I have ordered two this year so far and may need one more. Even my 8yr old Grandson loves this fruitcake. Totally yummy! this time I bought the 3 pound fruitcake because I was so thrilled with my previous years 1 pound cake. This is what a fruitcake should be like. I try to convert all of those fruitcake haters by telling them they just have not had a really good fruitcake, then I tell them about yours. Thank you for never letting me down. A little pricey though, but it hasn't stopped me yet! Honestly, all the fruitcakes on the site are great. We've gone through all of them with this being the most recent. It is very dark with great fruit and nuts. Unique in that you can cut this paper thin and it holds together. You can hold the slice to light and it's like stained glass with the fruit as windows. Highly recommend. First time to try this fruit cake...what a wonderful treat. the intense flavor is almost indescribable, it is truly a treat, a small slice of heaven..
Bought it for myself because I love fruitcake but no one ever gives me any. I am trying to take it in small servings since I shouldn't have it in the first place (due to type 2 diabetes). I dole it out to myself and struggle not to pig out, although I'd love to. A BIT more brandy in it wouldn't be amiss, however. I'll be buying it again, maybe even this year. Excellent product at a fair price. Was well received by my family. Absolutely delicious fruitcake. Moist and full of nuts and fruit. This is the first time I ordered it and it lasted less than a few days. I ordered another one soon after. Its a wonderful addition to all the traditional foods we enjoy at this time of year. I will definitely come back here for fruitcake in the future. The shipping is very secure and fast. Thank you for offering such a high quality product. Happy Holidays! Some of the best tasting fruitcake I've had in 25 years. Ordered 3 fruitcakes this year and shared with friends and all agree, some of the best ever. Arrived fast and fresh. Just sorry cake get all year long. One purchases a dark fruitcake with some trepidation. Will it be truly dark? Will it be brandied enough? Will it be moist and delicious? This one passed all tests, and given that I have an English taste and well over a century of known fruitcake bakers in the family, my tests are severe ones. So for those who like dark fruitcake, this is the one. I lived the first 35 years of my life in Canada. Fruit cake is one of my fond memories of Christmas. I had to stop myself...Almost ate the entire 3lbs of cake in two days. I offered some to friends so as NOT to eat the entire thing. Will be ordering another one SOON!! I sent this to my mom because she was longing for how fruitcakes were once made, the dark stuff. I sent her a dark fruitcake and she loved it. She went on and on about it and so I'm going to have to get one for myself. An excellent fruitcake. My wife and I enjoyed it. Not as much fruit, more cake, than the Trappist Rum Fruitcake; but still very, very good. I'd recommend to any fruitcake lover. Always the most moist and delicious. I used to make my own but these are outstanding. Full of fruit and nuts and none of the dreaded peel! I like fruitcake. It is a family tradition. I like dark fruitcake, for that is the British tradition. This cake was great dark fruitcake, with the right amount of brandy, and a delicious melt-in-your mouth taste. It is dangerous, however, for one may lose one's self-control when one starts eating it. I have always hated fruit cake till I tasted this one. It was awesome! It's a bit pricey but totally worth it. Fruit cake was delicious as expected, Thank You. Bought this for my mom and she loves it - I'm a repeat customer. I order one every year for the holidays. Never thought I particularly liked fruitcake ... until I tasted this! Best fruit cake we ever ate scotmid. truly the finest fruitcake I have had. The fine ingredients and the aging process are obvious in the taste and texture. Didn't get to eat as much as I would have liked because even people who swore they didn't like fruit cake were eating it! Fantastic fruitcake. It's now an annual requirement. My father loves it and we share with several friends. We start on it the week of Thanksgiving and usually finish around New Years. 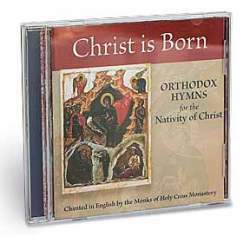 We've tried all the others at Monastery and this is the favorite. I enjoy my Fruitcake. I live alone so I get to eat it ALL and you always do a very good job of making my annual Fruitcake delicious! I will purchase it again next year, and later on in 2019 I will purchase some Preserves for my toast. Thank you very much. your products are the BEST and very 'Home-Made.' Until in early Spring when I order my Preserves. Blessings and THANK YOU! Just the right amount of Fruit and Nuts. Not a lot of dough in this cake and that's what I like about the Best. Well the Brandy maybe the BEST PART. LOL. Keep Baking! I'll be BACK.